Very depressing. I just read that Bob Dylan is putting out a Christmas album and he will be "singing traditional favorites like Winter Wonderland". It is for the benefit of a charity, but what a way to raise money. I can't even imagine who would want to buy it. What happened to all the creativity of the 60's counterculture? Did we use it all up or blow our minds out on the drugs? Getting old is so strange. Watching all these old former hipsters and idealists either totally sell out or be continually trying to resurrect their moment of glory. 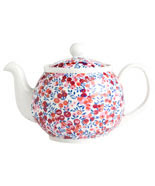 But I can always enjoy a Liberty Teapot.